Like a hypnotist’s pendulum, this fifteen minute visual experience will charm you with its rich variety of mesmerizing patterns, all drawn by hand before your eyes. An amazingly meditative trip, this work by Mikhail Sadovnikov is entirely dynamic and temporary. Each addition necessarily involves subtraction as new shapes continuously erase and overwrite what you see. 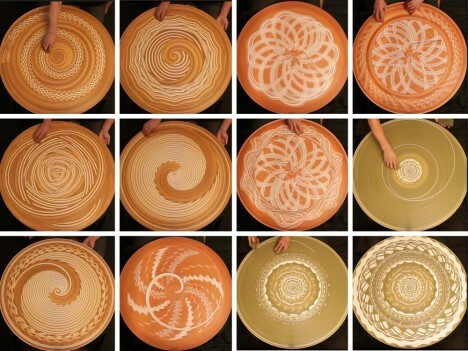 Using the clay residue left on the wheel between throwing pots, the artist moves between a series of sequences set to music of various styles and speeds. 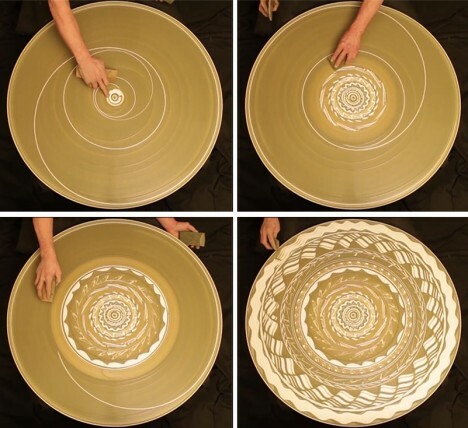 Sometimes symmetrical, other times abstract but always contained in a simple circle, the pacing and control are amazing – but you really have to watch the video to see for yourself and witness where sand mandala making meets fluid finger painting.